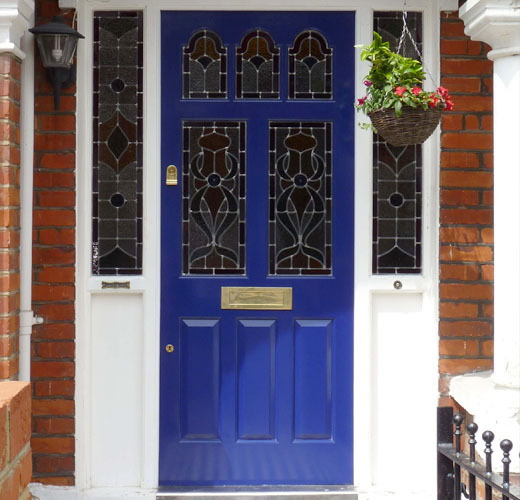 Would you like a new Edwardian front door for your property? We design and handcraft completely bespoke front doors in the most popular Edwardian styles. Our Edwardian door designs are thoroughly researched for authenticity and are based on the many originals we have in stock. If you have something particular in mind we are happy to work with you in order to create your perfect door. Browse our range of Edwardian front door designs, available in a number of common sizes. Alternatively request a quote for a fully bespoke Edwardian front door. Below you can view further examples of the Edwardian front doors we have designed and manufactured for customers across the United Kingdom. We can also create Edwardian style stained glass panels when needed. We have a large range of Edwardian designs we have previously made which you can browse for inspiration. You can have any of these designs re-created in your desired colours and sizes, or create one with us. Edwardian Britain was a short lived period and was very similar in style to the Victorian period. Front doors continued to be highly important as they provided a statement about the wealth of the occupants. They helped convey the right impression to anyone approaching or passing by. The Edwardian era saw carved door panels and frames decorated in a wide range of painted colours. They often used contrasting shades for added effect. Moulded panels and ornate glazing were standard. Normally the doors featured a large glazed overhead top panel to allow lots of light into the hallway. Beautiful stained glass panels and gleaming door furniture would often be used as the finishing touches. This period saw a rise in the popularity of multiple glazed panels. Whatever the style or status of the house, an imposing front door became an essential feature of most Edwardian homes. This theme has stood the test of time and is still very popular today. The development of glazing and the manufacture of larger panels of glass in the late 1830’s enabled it to be incorporated into front doors. Initially only the two upper panels were glazed but by the 1880’s the entire top half of a door might include leaded panes and patterned coloured stained glass. The colours were changed from the well know Victorian Red to Edwardian Blue during the period. Many Edwardian front doors would feature a hood above in order to protect one from the weather. Fanlights were also used, typically in the traditional Georgian style but decorated with intricate ironwork designs. We offer a large range of fully bespoke stained glass panel designs to suit your door. Many internal Edwardian doors were solid panelled doors, usually with three panels. There were many which contained stained glass or regular glass inserts to compliment the walls and floors, along with the furniture and accent items. Cast iron and brass continued to be a highly popular and was used in the creation of Edwardian door furniture. It was used for door knobs, knockers and hinges. The designs echoed back to the previous century with designs like lions heads and urns. House numbers would often be engraved onto overhead glass panels. Alternatively brass number designs were used. If you’d like a Edwardian front door created to update the look of your home, or if you wish to restore your period property, we can help. Get in touch to discuss your requirements. Take a look at some of the many Edwardian door projects we have completed for our customers over the years.